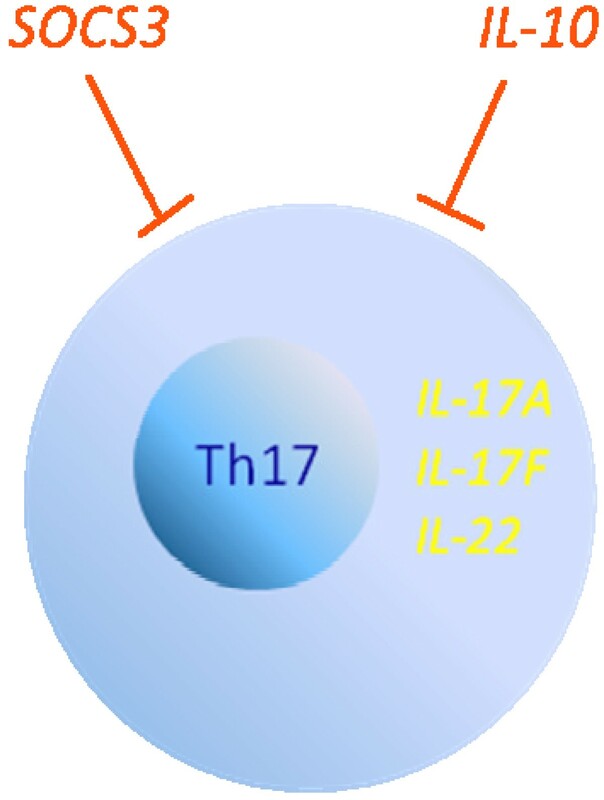 Th17 cells are thought to play a pathogenic role in various autoimmune diseases. Cytokines secreted by Th17 cells like IL-17, IL-17F and IL-22 have the capacity to mediate a massive inflammatory response. These proinflammatroy cytokines are likely to mediate the pathogenic potential of Th17 cells. Recent evidence suggests a role for Th17 cells in the breach of immune tolerance. This might shed some new light on the pathogenic role of Th17 cells in autoimmunity. In this issue, Yu and colleagues  present a report on gene expression profiles of antigen (Bhsp65)-tolerized and preclinical arthritic rats with adjuvant-induced arthritis (AIA). AIA is a widely used animal model of rheumatoid arthritis, which is inducible in rats by immunization with Mycobacterium tuberculosis (Mtb) in complete Freund's adjuvant . It is a predominately CD4 T cell-mediated chronic disease with clearly identifiable disease phases, including incubation, onset, peak, and recovery [3, 4]. AIA has many features resembling rheumatoid arthritis; therefore, it has been extensively used for investigating the pathogenesis of rheumatoid arthritis and in preclinical studies. The Mycobacterial 65 kDa shock protein (Bhap65) has been identified as an important disease-related antigen in AIA . Pretreatment of rats with Bhsp65 protect them from AIA, providing a good model for investigating immune tolerance [4, 5]. In a first step, Yu and colleagues investigated the gene expression profiles of lymph node (LN) cells of arthritic rats at different clinical phases of AIA. Interestingly, compared with naive controls, maximal gene expression changes were observed in LN cells of rats in the incubation phase instead of the peak or recovery phases. Most differentially expressed genes at the incubation phase were upregulated, while most at the peak and recovery phases were downregulated. This observation is consistent with findings from a collagen-induced arthritis study in mouse , suggesting that immunological processes are active in the LN during this preclinical stage and that this process might be critical for arthritis development. Aiming to identify the gene expression signature of Bhsp65-induced tolerance, Yu and colleagues further investigated the gene expression profiles of Bhsp65-tolerized and preclinical arthritic rats. They observed only minor differences in the gene expression profiles of LN cells in the incubation phase between Bhsp65-tolerized and preclinical arthritic rats. However, when they stimulated those cells with Bhsp65 in vitro, dramatic differences were observed between cells from Bhsp65-tolerized and preclinical arthritic rats compared with unstimulated controls. By comparing the gene expression profiles of Bhsp65-tolerized rats and preclinical arthritic rats, 12 genes were identified as encoding signature molecules of the Bhsp65-induced tolerance, including Cd86, Il1b, Lta, Socs3, Il10, Vegfa, Ifi27l1, Il17a, Il17f, Il22, Il33 and Cxcr7. Interestingly, 5 of those 12 signature molecules are Th17 cell related. Il17a, Il17f, and Il22 encode the signature cytokines of Th17 cells , while proteins encoded by Socs3 and Il10 are essential negative regulators of Th17 cells [8, 9]. Since Il17a, Il17f and Il22 were upregulated in only the preclinical arthritic rats while Socs3 and Il10 were up-regulated in only the Bhsp65-tolerized rats, it shows that there were strong Th17 responses to in vitro stimulation with Bhsp65 in the preclinical arthritic group. The Th17 response to Bhsp65 is absent in the Bhsp65-tolerized group, and this absence might be due to the suppression of Th17 negative regulators (Figure 1). In contrast to Th17 cell-related genes, the Th1 and Th2 cell-related genes Ifng and Il4 behave differently, that is, Ifng is upregulated and Il4 is unchanged in both tolerized and preclinical arthritic groups. These results suggests that Th17 cells might play a role in the breach of immune tolerance. Five Th17-related signature genes of Bhsp65-induced tolerance in adjuvant-induced arthritis. Upon stimulation with Bhsp65 on lymph node cells, genes indicated in yellow are upregulated in preclinical arthritic rats but not changed in Bhsp65-tolerized rats, while genes indicated in red are upregulated in Bhsp65-tolerized rats but not preclinical arthritic rats. Th17 cells are a recently identified subset of CD4 T cells, with a primary function of clearing extracellular pathogens during infections . Although they have been recognized as key players in adaptive immunity, they were initially identified in autoimmune disease research in 2005 [10, 11]. Since then, extensive studies have been performed and confirmed a pathogenic role of Th17 cells in various autoimmune diseases and their animal models [7, 12]. Nevertheless, the pathogenic characteristics of Th17 cells in autoimmunity are only partially known. Studies have already shown that Th17 cells secrete cytokines, including IL-17, IL-17F and IL-22, and are able to mediate strong inflammatory responses . These pro-inflammatory cytokines could explain, at least partially, the pathogenic characteristics of Th17 cells in autoimmunity. However, whether other components contribute to the pathogenic characteristics of Th17 cells is not clear. Recently, studies have investigated the role of Th17 cells in immune tolerance. In 2008, Wang and colleagues  reported that IL-17 could interfere with MBP 68-86-induced immune tolerance in experimental autoimmune encephalomyelitis. In 2009, Satpute and colleagues  reported that Bhsp65-induced tolerance in AIA is associated with the reduction of IL-17 production. More recently, Peron and colleagues  showed that oral tolerance is associated with Th17 cell reduction in experimental autoimmune encephalomyelitis. Taken together, these studies suggest that Th17 cells might play a role in the breach of immune tolerance, pointing to a new mechanism mediating their pathogenic role in autoimmunity. However, this needs to be validated and the mechanism behind it needs to be investigated further.